The field of management education and research has become an industry of its own - an industry with fierce international competition in a global arena. Here, the authors argue that a series of mechanisms has led to mimicking and thus strategic convergence among business schools. The authors further argue that this has resulted in a loss of relevance and diversity of the management knowledge produced and taught in a multipolar world. They view this as counterproductive to business schools, students, firms, societies and other stakeholders, including scholars themselves. Based in part on the work of SFM (Societe Francaise de Management - the French Academy of Management), the authors of this volume endeavour to engage in strategic conversations with stakeholders in an effort to reshape the field of management studies. Redesigning Management Education and Research revisits the foundations of management research and education, suggests ways to redesign the content taught to better fit the needs of firms and society at large, and proposes actions and concrete examples of what could be done to restructure the institutional setting of the field of management. This book calls for collective strategies from management scholars to influence some of the de facto regulation mechanisms that have appeared over recent years, such as business school rankings and the race for publication in a narrow list of academic journals. This book is also a plea for working on those issues beyond the specificities of national contexts to encompass a broader regional perspective in order to reshape the rules of the game in management education and research. Teachers, researchers and deans, as well as practitioners from all areas of business will find this volume illuminating. 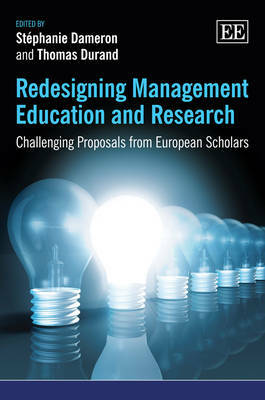 It offers an ambitious vision and a practical framework aimed squarely at remaking management education and research to be relevant to the demands of the twenty-first century.